Fill Rate = # of ad delivers/ # of ad requested. For instance; If the publisher sends 100M ad request to ad network and the network returns 45M ad delivers(impression) back to publisher. The fill rate of the publisher is equal to %45, which means %55 of your traffic seen empty ads = % 55 revenue opportunity lost. Secondly, eCPM (efficient cost per mille (thousand in Latin)) refers the earnings and the impression in thousands relationship. For instance, if your ad gets 250 impressions with $5 earning, your eCPM rate will be $20((5/250) *1000). Network X returns %20 fill rate with $10 eCPM and Network Y returns %80 fill rate with $2.5 eCPM. So that, you got 25K impression from network X and 80K impression from network Y. (higher fill rate)! 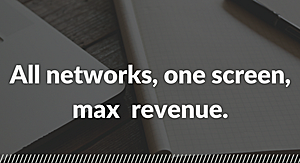 Simply, any network with higher eCPM or higher fill rate mean higher revenue generation to you. Working with multiple ad network will get better results on your monetization. Though, optimizing all these networks and your earnings; you must analyze each network for each ad placements, ad types, location and time zone is really crucial. Which is almost impossible! Fortunately, ad mediation systems emerged to enable control all these connected networks to your app from one screen. The number of ad mediation systems are increasing day by day and mainly all focused to allow control of your ad networks and optimize the stats in some algebra, which is the pros of these system. However, the cons are; the most ad mediation system are the extension of an ad network and still leave all control and management to the publishers. These mobile mediation systems knows the quality of the request and positioned their placement on waterfall due to the value of the request and bids of other ad networks; that is not an optimal solution. Admost is the new mediation router! Firstly, Admost is not an extension of an ad network; solely independent mobile mediation company between ad networks and mobile publishers. Secondly, Admost focused on neither eCPM nor fill rate or networks; totally revenue based tool. Our waterfall model let publishers to get the maximum benefit from each ad networks. We value all the data within ourselves, keep it updated and refresh the waterfall frequently per country, per ad zone and per user. Counting impression on its owned database helps waterfall to calculate optimal(real) eCPM rates and provide a fair competition between all ad networks. Our experienced business and technical team interiorise your apps as ours, give a boutique service to each publisher; selecting best proper ad networks, smooth integration and testing, network negotiations and marketing activities. Admost optimizes 12 billion monthly impression on average for now and welcoming new worldwide publishers day by day.